While good intentions matter a great deal, results matter most. The federal decision to impose a national carbon tax policy may be well-intentioned, but its effects may be detrimental to our economy. We’ll likely see its worst effects on New Brunswick. The idea is to give carbon a price. While there are a few ways to do this, the federal government is taking the familiar route of taxation. This is the same approach taken with tobacco or alcohol: the higher the price, the lower consumption should be. Taxing carbon is different than taxing sugar, however. An individual can give up or dramatically reduce her sugar intake. But taxing carbon affects over 90 per cent of the energy we consume. We use hydrocarbons in the production, manufacturing and transportation of almost everything. That said, some sectors of the economy will be hit harder than others. Transportation and manufacturing, for example, will face hard decisions with higher costs of doing business. They may be forced to make big capital investments to stay in business. No business will escape and, almost inevitably, the increased costs of the new carbon tax will be passed on to consumers. For businesses that face world markets, the competitive pressures become much greater. Many foreign producers are not subject to the same increased costs the federal government is now putting on business in Atlantic Canada. So how will it be worse in New Brunswick? There are three main reasons. First the carbon tax will slow the already-faltering New Brunswick economy beyond forecasted slow growth. A carbon tax can eat away as much as three per cent of growth, when the New Brunswick economy is set to grow less than one per cent this year – the lowest in Canada. Political pressure will mount for government subsidies, which defeat the purpose of the carbon tax. What’s worse, New Brunswick cannot afford to hand out more subsidies, no more than it can afford to erode productivity by continuing to raise taxes. Second, New Brunswickers find themselves in a difficult, but unique spot in the federation. Perhaps out of a desire not to be distracted from its local priorities, the provincial government will not be setting up a carbon tax framework of its own. 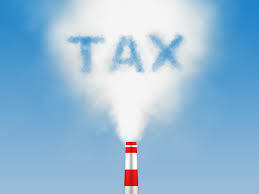 As a result, carbon taxing in New Brunswick would be performed by the federal government, as New Brunswick is the only province to cede such room to Ottawa. This means the province has partially given up its ability to improve the lives of residents. For New Brunswick, carbon decisions for the province will be made in Ottawa, based on priorities far removed from the people who will be most affected by them. Third, and most importantly, New Brunswick’s largest foreign trading partner – the United States – is not imposing its own carbon tax. This will seriously erode competitiveness across Canada, but it will be especially hard on those Atlantic industries relying heavily on hydrocarbon consumption: trucking and transport, fishing, mining and forestry, to mention a few. The aggressive federal target to reduce 30 per cent emissions in the next four years would also put New Brunswick at a disadvantage with other provinces, particularly Quebec – whose cap-and-trade system is targeting 20 per cent in carbon dioxide reduction by 2020. The federal government’s national carbon policy will be measured against the claim that it can concurrently reduce carbon emissions and grow the Canadian economy. But imposing such an aggressive experiment on New Brunswick by remote from Ottawa is fraught with significant risks. At the least, it may bring the province’s economy to an abrupt stall.